Spring is a time for fresh ideas, fresh starts, and fresh air! Growing up in the northeast, spring also means (to me) a last big snow, cold mornings, soggy ground, and pops of color from the flowers brave enough to face the cold temperatures. We wait all winter to see the snowdrops and crocus, as we know they are the harbinger of warmer days ahead. We long for peonies, roses, and to be past the last frost so we can get some serous gardening done. ABOVE (left to right, clockwise): Alternate colorway for Shanna Steele’s Beads in Bloom bracelet; blue-eyed grass seed; alternate colorway for Shanna Steele’s Beads in Bloom bracelet; daffodils; Spring Celebration Bracelet by Cynthia Rutledge; snowdrops; Garden Dream necklace by Lynda Taylor. While we wait . . . why not bead up a garden of flowers? These artists have done just that with beaded flowers. Take a look! Cynthia Rutledge’s Spring Celebration Bracelet takes a lattice woven base over-the-top with embellishments. The beaded flowers and vines she created are made with tubular peyote and fringe. The colors, the movement, and the design(!) has this pattern high on my list! 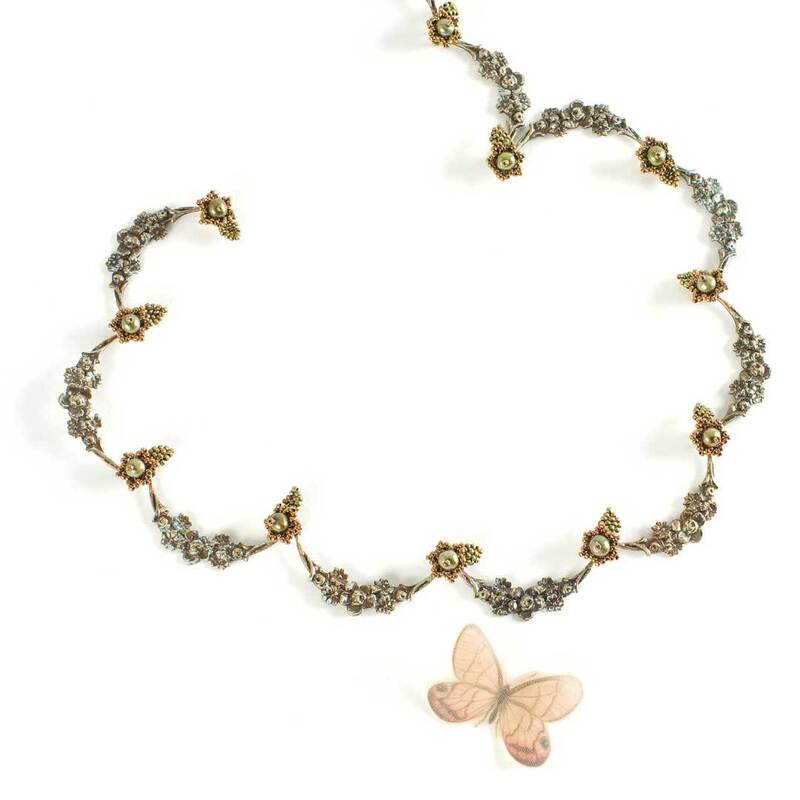 Melinda Barta combines sweet beaded flowers with patinated brass components to form this beautiful necklace. This is a Custom Cool project, so she shares how to create the flowers; the necklace is just one way you can use them! 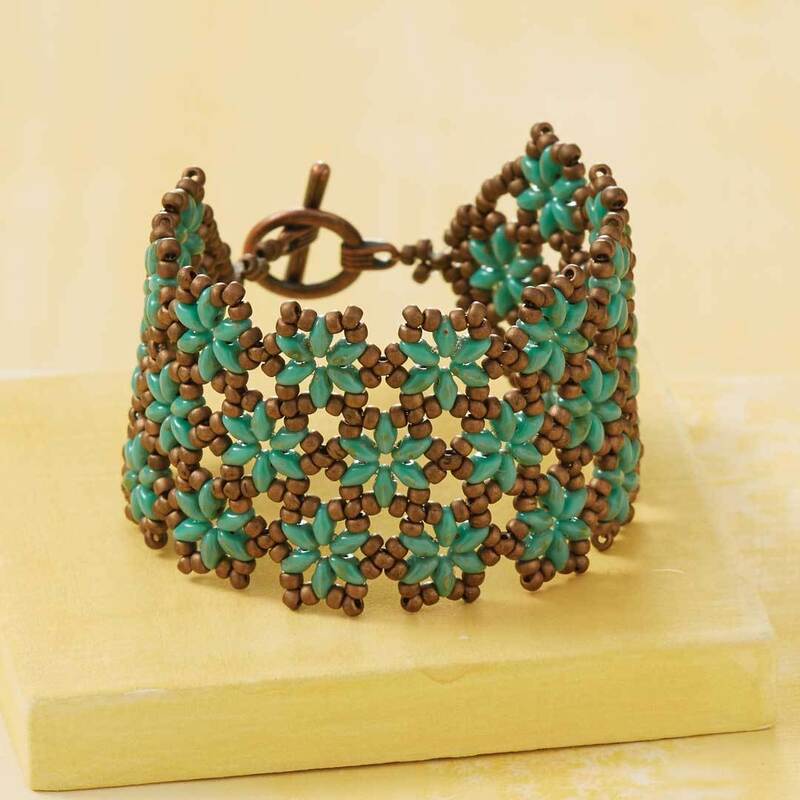 Beads in Bloom bracelet by Shanna Steele is a sweet design that gets its impact from rows of right-angle weave beaded flowers stitched together. You can create this bracelet as many rows tall as you’d like and could easily turn this into a beaded collar or a beautiful spring table runner! From my grandmother’s era to the proms today, a type of corsage is still in order for that special occasion. 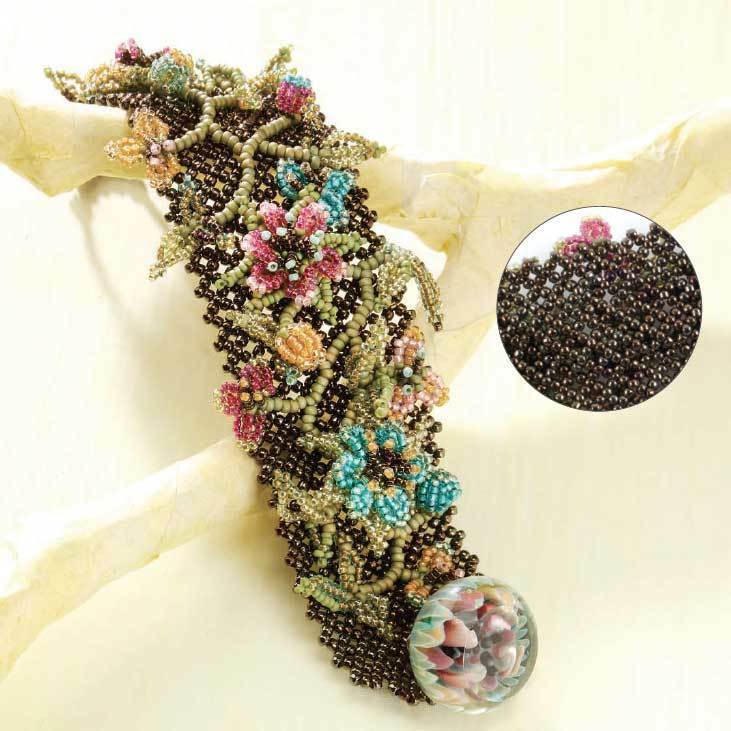 In Garden Dreams, Lynda Taylor creates a beaded corsage-like bloom using peyote, herringbone, netting, and embellishment techniques. The bloom, along with leaves and other embellishments, are all placed on a necklace that will remain timeless. Looking for more inspiration? How about beaded flowers you can place in a vase? Read How to Make Beaded Flowers the French Beaded Flower Way. 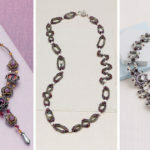 And be sure to also read 12 Bead Weaving Projects to get you even more excited about creating new designs. Enjoy the sunnier days, the warmer temps, the birds, and the flowers as spring makes its way to you, too. 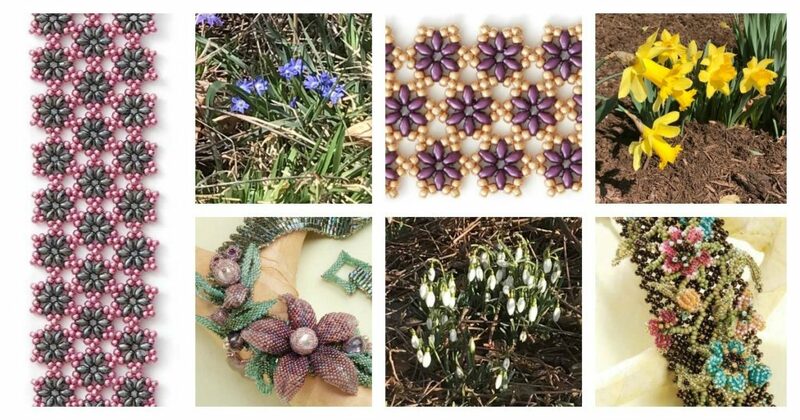 Get inspiring spring-filled designs and beaded flowers in the Interweave Store!